Virtual reality (VR) is the new must-have technology tool for gaming, training, or just trying to immerse yourself in a new and virtual environment. From Google Cardboard to Oculus Rift, this technology is becoming more and more accessible to the everyday person. Now anyone can put on a headset and suddenly be transported to a world where they have full control and no consequences. VR technology isn’t just useful for gaming. It has been shown to help in a variety of applications, from military training activities to treatment for anxiety disorders and phobias to functioning as an art form. Another application where VR shows a lot of promise is stroke recovery. Virtual Reality has emerged as a new approach to treatment in stroke rehabilitation settings over the last ten years. By simulating real-life activities, stroke patients are able to work on self-care skills in a setting that is usually impossible to create in a hospital environment. 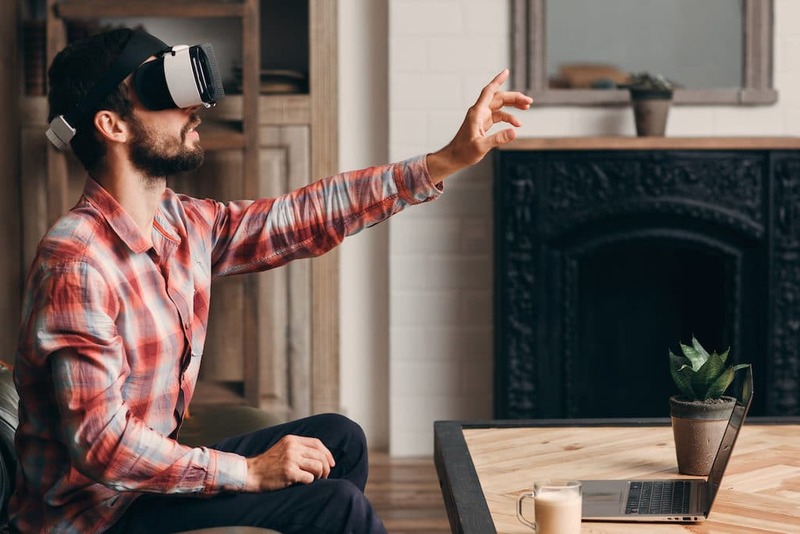 In immersive VR, the virtual environment is delivered by equipment worn by the user (like goggles) or the person is situated within a virtual environment. This fully immersive system gives the user a strong sense of presence through the use of head-mounted displays, special gloves, and large, concave screen projections to create the sense of immersion. Non-immersive VR is usually two-dimensional and delivered through a computer screen. The user can control what is happening on screen by using a device such as a joystick, mouse, or sensor. After a stroke, mass practice, task-oriented arm training of the upper and lower limbs can help the brain “re-program” itself and form new neural connections. These new connections stimulate recovery of motor skills in patients following stroke. So VR may be useful to augment rehabilitation of the upper and lower limbs in patients suffering from stroke and other neurological injuries. In some studies, therapists have manipulated the image onscreen to make the patient’s limb appear to be moving faster and more accurately than it was in real life. Doing this increased the patient’s confidence and made them more likely to use their affected limb spontaneously. Spontaneous use of the affected limb can help the limb recover more completely. SaeboVR is the world’s only virtual rehabilitation system exclusively focusing on ADL’s (activities of daily living). The proprietary platform was specifically designed to engage clients in both physical and cognitive challenges involving daily functional activities. In addition to interacting with meaningful every-day tasks, the SaeboVR uses a virtual assistant that appears on the screen to educate and facilitate performance by providing real-time feedback. SaeboVR’s ADL-focused virtual world provides clients with real-life challenges. 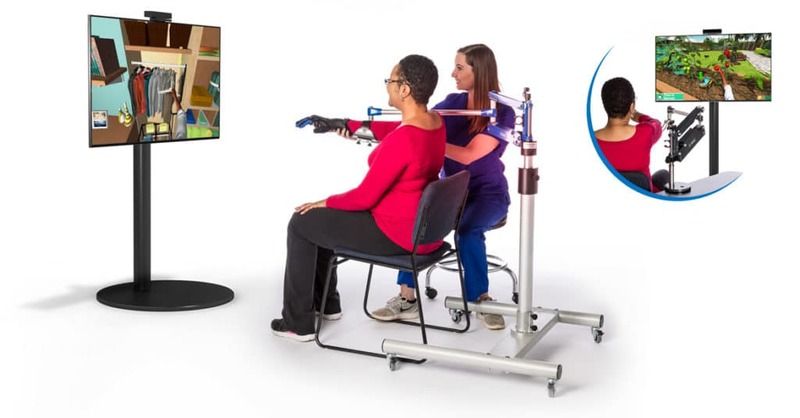 Users will incorporate their impaired upper limb to perform simulated self-care tasks that involve picking up, transferring, and manipulating virtual objects. It’s the only virtual system available that focuses on real-life self-care tasks. Let’s you practice repetitive movements with fun and motivating activities. Activities are adaptable to the individual client to maximize success and outcomes. ADL tasks can be customized to challenge endurance, speed, range of motion, coordination, timing, and cognitive demand. It includes a clinical provider dashboard to view client performance and participation trends. Reports are graphically displayed for easy viewing. 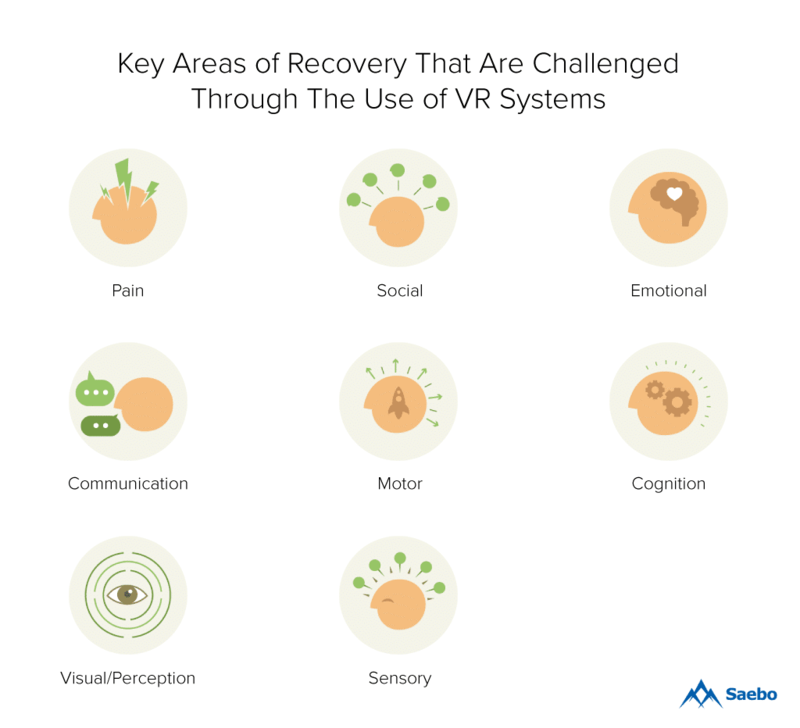 Saebo’s other products can also be used in conjunction with the SaeboVR to facilitate recovery. The SaeboMAS and SaeboMAS mini use unweighting technology that will allow clients with proximal weakness to participate in proven treatment techniques that would otherwise have been impossible. The SaeboGlove can engage and position the hand so it can be incorporated in virtual grasp-and-release activities. Virtual reality is here to stay, and we have likely only scratched the surface of its medical applications. It’s having a powerful impact on those who have had strokes. Stroke survivors are taking advantage of how VR enables them to practice necessary routine activities, create new connections in the brain, and build up their confidence. With more and more survivors retraining their limbs using this technology, the future of VR in stroke recovery looks bright.